What do we want? Stickers! What kind do we want? ...actually, that is a great question. At StickerYou our business is making your message stick, but just how do you choose which sticker is best for your message? Here is a quick rundown of our most popular formats, materials, and most common applications. 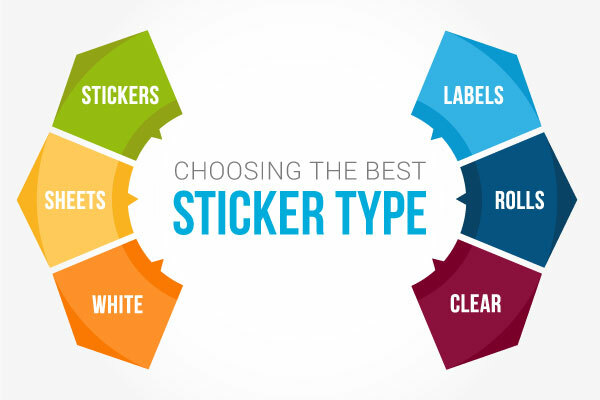 The first thing to decide when creating your stickers and labels is whether you want stickers and labels on a roll or a sheet. Rolls are ideal for labels and we have a few different options where our sheets are great for any occasion and for smaller quantities. Rolls are the most popular format when it comes to ordering labels. No matter what your business does we will have a label that will fit your need. Roll labels and stickers can be used as business stickers and provide a quick and effortless way to label your products or brand your promotional material. Paper Labels are easy to dispense and distribute while also being our most reasonably priced option. Paper Labels/Stickers are very versatile and they are the perfect label for just starting out, or when ordering massive quantities. BOPP (Durable) Labels are ideal for labeling products or for use on smooth surfaces. This product is water resistant, UV fade resistant, oil resistant, heat resistant and abrasion resistant, making it truly durable and useful in a variety of environments. These labels come with a permanent adhesive and are available in custom shapes and sizes as well as standard shapes. Clear (Polypropylene) Labels have great full-color reproduction, which will ensure your logo or label design looks great. The durable, tear-proof material with permanent adhesive will help keep your label in tact and in place on your product. Writable Labels are a quick and easy way to label your products while customizing each label manually with a date of production, best before, or flavor or scent categorization. These labels have a durable strong adhesive and they can be written on with pen, pencil or marker. Foil Labels have an eye-catching shiny metallic finish will help to highlight your product or packaging giving your branding an added appeal. 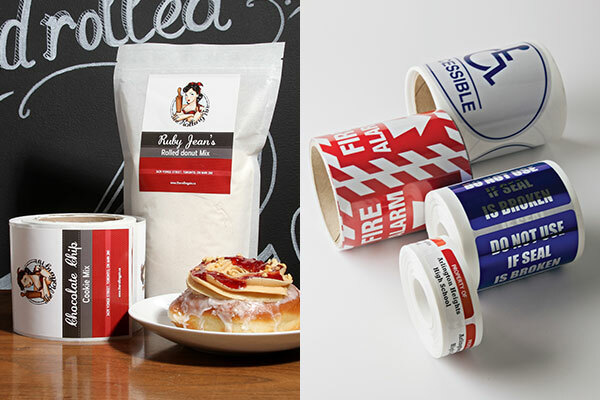 These labels or stickers are perfect for use in your business or DIY projects. Popular for gifting or creating custom wine labels or premium products. Sticker and Label Sheets are a great option for smaller quantity orders and giveaways. White Vinyl Stickers & Labels are the perfect multi-purpose solution to most scenarios. They are great for outdoor use, home organization, marketing materials (i.e. promotional stickers), and as jar labels. White Vinyl is great for any sticker or label which needs to withstand the elements like bumper stickers or stickers for sports equipment. White vinyl is also dishwasher safe. Clear Vinyl Stickers & Labels really make your designs stand out. They are perfect for most glass jars (honey jars, pickle jars, beer bottles, juice bottles, etc.) and they give a certain elegance to any container they are applied to. We also see them on phone cases as they can be removed and switched out at any time. They are also the best choice for Car Window Stickers. Premium Kids’ Labels are weather resistant, stick strong and endure the fridge, freezer, washing machine, and dishwasher so you can label just about anything. When it comes time to remove them, they come off clean leaving no messy residue behind to harm your products. Premium kid's labels are perfect for labeling school supplies and lunch containers. Permanent & Stick-On Clothing Tag Labels work as an alternative to iron-on labels. They are perfect for use on sewn in clothing tags and with their super-sticky material, there’s no need to iron-on these labels, you can simply stick them on. Die-cut singles are a great option for if you'd like individual stickers that are die-cut to the shape of your design. 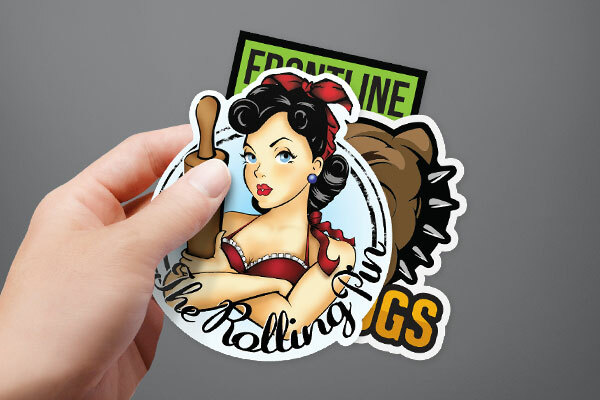 Die-Cut Sticker Singles are high quality individually die-cut vinyl stickers easily made in any size and shape at the quantity you need. Our proprietary Sticker Maker online technology enables endless customization options and your precise sticker die-cut will match any design! 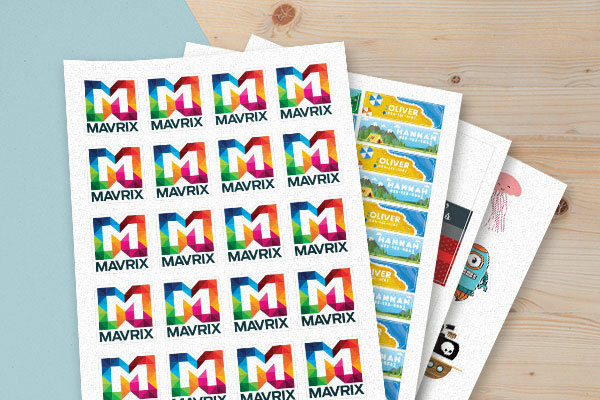 We hope this guide will help you to decide which format and sticker are best for your needs. Regardless of which stickers or labels you choose we will help make your message stick; any size, any shape, any quantity.